MOSCOW (AP) — The search for three women suspected of planning terrorist attacks at the 2014 Sochi Winter Olympics has raised one of Russia's most feared specters — the female suicide bombers known as "black widows." For more than a decade, women have committed many of Russia's worst terror attacks, downing airliners, blowing up subway cars and killing people going to a rock concert. The term "black widow" refers to the belief that these women took the desperate step of becoming suicide bombers in order to avenge husbands or male relatives killed in Russia's long fight against Islamic militants in the Caucasus region. 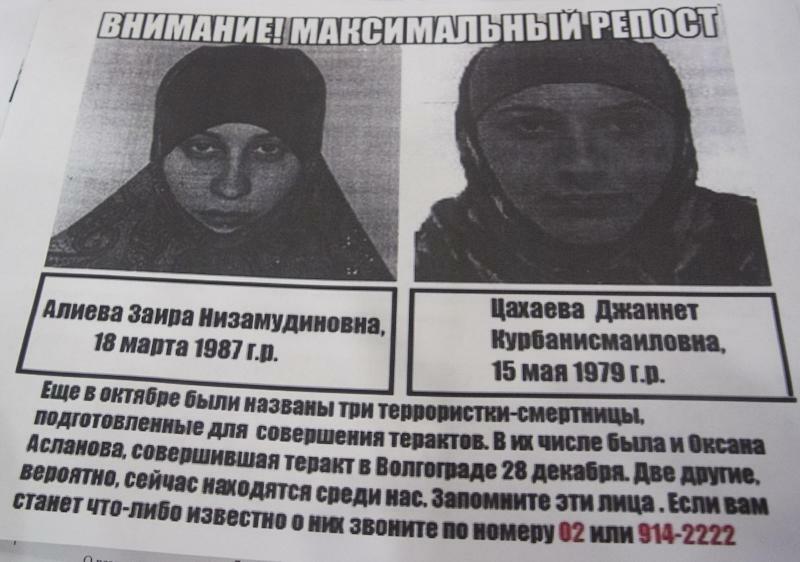 Russian police leaflets circulating in the Olympic host city of Sochi say that one of the women suspected of planning an attack at the Winter Olympics is the widow of a militant. But there have been cases where the bombers' husbands were alive at the time of their attacks, and one failed bomber said it was shame and a lack of money that drove her to terrorism. One of the earliest attacks to draw attention to female terrorists was the 2002 mass hostage-taking at a Moscow theater by Chechen militants — 19 of the 41 attackers were women. The crisis ended with Russian forces pumping narcotic gas into the theater, killing all the attackers and at least 118 of the approximately 850 hostages. Police footage after the raid showed some of the women dead in theater seats with explosives attached to their bodies. In 2003, two women blew themselves up at the entrance gate to a Moscow outdoor rock concert, killing 14 people. In the first wave of a shocking series of attacks in 2004, two Russian airliners were brought down with bombs on the same night, killing a total of 79 people. Authorities said both of the bombers were women, and one had a brother who had disappeared in Chechnya. A week later, a female suicide bomber blew herself up outside a Moscow subway station, killing 10 people. Early reports identified her as a sister of one of the plane bombers. But authorities later said the sister instead was one of two females among a group that seized some 1,100 hostages the next day at a school in the town of Beslan. Russian forces besieged the school and at least 380 people were killed. In 2010, twin blasts on the Moscow subway that killed at least 40 people in one day were blamed on women suicide bombers. Last October, a suicide bomber married to an Islamic militant killed six people on a bus in the southern city of Volgograd, just a few hundred miles (kilometers) from Sochi. Her husband died in a clash with Russian forces a month later. Just five days after the rock concert bombing, a Chechen woman planning to bomb a Moscow cafe lost her nerve and told cafe guards she was carrying explosives. A bomb disposal expert was killed when her bomb blew up while he was trying to defuse it. The woman, Zarema Muzhakhoyeva, later told a Russian newspaper she had turned to terrorism after her husband was killed in a business dispute and she had stolen jewelry from her grandparents and been frozen out by relatives. Two women planning to wear suicide belts to Red Square on New Year's Eve 2010 were foiled by a simple error. Their bombs were to be set off when their handler sent text messages to the cellphones connected to the bombs. But before then, one of the phones received a spam message, blowing the woman bomber up. The plot leader and the surviving woman were arrested and sentenced to prison.